Black bears (Ursus americanus) are one of the most sought after residents of the Great Smoky Mountain National Park and the surrounding areas. The problem is while most human bear interactions are harmless, serious injury or death can occur if a bear is provoked or if a deranged animal decides to attack even if it is unprovoked. While any encounter with a black bear in the Smokies can be dangerous or even deadly, day hikers and backpackers encounters may have an even higher risk due to isolation from help and rescue and the lack of a substantial shelter to get away from the bear in case of attack. The Great Smoky Mountain National Park has regulations prohibiting the feeding of their native black bears which are strictly enforced for a good reason FEEDING BEARS KILLS BEARS AND PUTS HUMANS AT RISK. Simply removing the reward of food greatly reduces the danger of bears to humans. Following these black bear safety suggestions can save your life and the lives of the Smoky Mountains favorite resident, the black bear. Black Bear in a field at Smoky Mountains Park. Bear proof trash cans are throughout the Park. 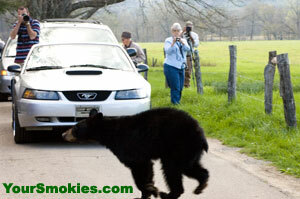 It's LEGAL to carry Bear Pepper Spray in Great Smoky Mountains National Park! 1) Never feed or toss any food to a black bear or any wild animal in the park. 2) Keep children and pets under strict control and if possible bring them to safety inside a vehicle or indoors. 3) Keep the bear at as great a distance as possible. If the bear notices you and changes it behavior such as feeding or the direction in which it is moving, you are too close, back away slowly from the bear and make lots of noise. If you are closer than 150 feet to a bear in the Great Smoky Mountains national park, or if it changes what is doing because of your presence, you are breaking the law. Never back a bear into a corner or surround it. Being too close to or threatening a black bear can cause the bear to exhibit aggressive behavior such as you being rushed towards by the bear or the bear swatting the ground. The black bear may even make popping noises with its jaw or other loud noises, which are indications the bear needs more space, so you should slowly back away from the bear and remember DO NOT RUN. 4) The majority of black bear related attacks to humans are minor and most black bear attacks on humans are a result of the bear attempting to get to peoples food. If it appears that a bear is interested in food you or anyone in your party has, let go of the food and slowly back away from the food and the bear. Don’t bring along very smelly food or cook food in a fire when camping as the smell will linger and can create a problem for the next set of visitors. When hiking or camping rinsing food out of plastic containers trash away from a camp site or where humans gather will reduce the smell of your trash. 5) A bear can run, climb or swim faster than any human can. If the backing away from the bear does not work and making as much noise as possible to intimidate the bear does not work, fight back using any objects you can find around you such as rocks, branches, etc. You should stand up large, and wave your hands in the air and act aggressively. Playing dead is a last resort and may still allow serious injury to anyone doing so. 6) Recent studies suggest that the more people in your party the lower the chance of a black bear attack. It seems that the magic statistical number where bear attacks virtually stop is 5. The less people, the greater chance of an attack. 7) Guns are now legal for some individuals to carry in the GSM national park since February 2010 as well as most other national parks although it is not legal to use one. Bear Pepper Spray is now legal to carry, possess and use in the Great Smoky Mountains national park. There are some areas outside of the Great Smoky Mountains national park where you are allowed to have firearms and/or Bear Pepper Spray for self defense against a black bear attack and use either one. While having a can of bear spray and knowing how to properly use it, or if you are an experienced marksman with the right gun and conditions outside of the national park could protect you during a black bear attack, it is never a substitute for responsible hiking, camping, food and garbage storage techniques. 8) It’s not uncommon for black bear to be found in residential areas in the Great Smoky Mountains especially in areas close to borders of the national park, national and state forests or other wild and wooded areas. People living, working and visiting these areas should also always secure garbage and treat their cabin, house or mobile home and the back and front yard with the same bear safety measures as a campgrounds. In recent years bears have been wandering in streets, swimming in pools and have attacked an elderly woman on the deck of her home in Gatlinburg where luckily she sustained only minor injuries. 9) The Great Smoky Mountain National Park asks that you report any bear attacks or incidents to a national park ranger at once. In areas outside the park, aggressive back bear behavior should be reported as well to 911. Being responsible can save lives and not following black bear safety rules can cause a bear to die. Feeding bears directly or indirectly is the cause of most black bear problems in The Great Smoky Mountain National Park and the surrounding areas. Black bear encounters happen outside the National Park by people staying in campgrounds, cabins and chalets or even in picnic areas. Responsible "black bear proof" behavior is required at all times that in areas that black bears may be present. Campgrounds and picnic areas offer the most challenge to bear proof since they are generally in more remote areas which may be in a black bears natural territory and the ever present enticement of food and other human belongings that may have an enticing scent to a black bear. The reason that picnic areas close way before sunset is so that maintenance people can be sure that there are no food scraps and there is no unsecured garbage to attract black bear and condition them to equate humans with being fed. Be prepared and protected from potential bear attacks Highest concentration of pepper spray allowed by law, a potent 2% Capsaicin and other related Capsaicinoids (3.2 million SHU). Humane, Legal and highly effective way to stop a bear in its tracks. EPA-Registered and Meets the expectations of the IGBC (Interagency Grizzly Bear Committee of US Forest Service). Meets and exceeds the recommendations of leading Bear Biologists. Approved for use in the Great Smoky Mountains National Park. Counter Assault Bear Deterrent has a shelf life of 4 years and comes with a glow in the dark safety wedge with tie string for added security. Highly effective against aggressive Black or Grizzly Bears. Size: 8.1 oz sprays 30 feet for 7.2 seconds; 10.2 oz sprays 32+ feet for 9.2 seconds. Shipping Weight: 1lb. Manufacturer model#: CA-12/PSB. 1) Since we know that feeding of black bears leads to dangerous encounters with humans the first rule is to keep your campsite or picnic area free and clean of all food, scraps including fruit rinds and cores, paper and plastic bags that contained food and even aluminum foil since the scent of food is a strong attracter of black bears in the Smokies. It is also a good rule to thoroughly clean plates, cups and silverware as soon as you are finished eating and to clean picnic tables and other eating surfaces immediately as well. 2) Do not leave any food, coolers or backpacks that contain food unattended. If it all possible stores these items inside your car, van or a hard sided camper. Remember candy, soda and other drinks (and even garbage) are food! 3) Keep children close by you on a hiking trails and do not leave small children, pets or service animals alone and unattended. Since they are less threatening to a black bear than an adult human, this can be a accident waiting to happen. 4) There have been reports across the nation of black bears and grizzly bears enticed by the scent of air fresheners and baby wipes breaking into cars, campers and tents. Bears have a great sense of smell and anything that has a strong scent - especially something that can be mistaken for food, should be kept out of bear country. There are approximately 1,800 - 2,000 black bears living in the Great Smoky Mountain National Park which is a population density of about 2 black bear per square mile. Black bears inhabit and are active in all areas and elevations of the park. It is believed there may be as many as 4,000 black bear inhabiting the state of North Carolina alone. Without natural predators, numbers of black bear and black bear encounters throughout the US continue to increase. Bear can run up to 30 miles per hour, are good tree climbers and can also swim very well. Black bears in the park do not hibernate, but will sleep for very long periods and may leave their den during warming periods or if they are disturbed. This is referred to as "winter sleep". Black bears generally make their den with the onset of cold weather so by the end of December there is almost no black bear activity in the GSMNP. Smoky Mountain black bears are unusual as they will often den high above the ground in hollows of trees, but will also den in hollow tree stumps, tree cavities or wherever they can find shelter. Some home owners bordering the park have had black bear make shelter for the winter and give birth to cubs under their porches. Black bears are most often seen in early morning or late afternoon into the early evening. The most common black bear sightings in the Great Smoky Mountains national park are in Cades Cove, Cherokee Orchard Road before and around the John Oliver cabin, The Roaring Fork Motor nature trail before the Grotto Falls trailhead and in Cataloochee between the Palmer Chapel and the Caldwell house. A black bears natural diet normally consists of: 59% berries and acorns, 28% grasses and forbs, and 13% insects and other animals including carrion. Biologist in the Great Smoky Mountains national park have confirmed in their extensive studies that less than 3% of black bears diet in the park consists of meat. Both male black bears called "Boars" and female black bears called "Sows" commonly have more than one mate and the most active mating occurs in July. Often cubs from the same litter will have different fathers. A pregnant black bear usually has 5 or more fertile embryos when she dens for the winter. She will not carry all of these embryos to term and will absorb what her body feels based upon her fat reserves. After a fall of poor acorn and other mast crops, expect smaller litters to be born than after a good year of forage for the bears. During the winter sleep a black bears heart rate will slow down from 50 beats per minute to 10 beats per minute. This is also when a mother bear gives birth to from 1 to 4 black bear cubs with 2 cubs being the most common. When born, black bear cubs weigh about 8 ounces and can weigh over 400 pounds when fully grown. Black Bears can grow up to 3 feet at the shoulder and 6 feet in length. Mature male bear (boars) are the largest threat to cubs. Black Bears can grow up to 3 feet at the shoulder and 6 feet in length. Even a small yearling bear has amazing strength for its size. Black bears that stay away from humans can live anywhere from 12-15 years, but those who are acclimated to humans generally do not live past 7 years. 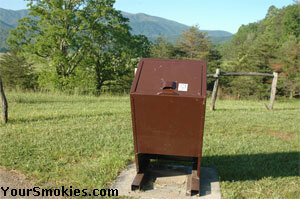 As of 2014, many garbage receptacles throughout the Great Smoky Mountains national park have been removed and the obvious consequences of this action is more trash in the park. More food scraps and more trash will obviously mean that more black bear and other wildlife will become habituated and thus we can expect dangerous or fatal interactions with park visitors, employees and volunteers. It is our opinion that the removal of these garbage cans is a disastrous mistake. In the past decade, the Smokies have seen more aggressive behavior as well as unprovoked attacks against humans resulting in serious and minor injuries, bears stalking humans and attacks against personal and national park property. The Black Bear population has been dramatically increasing within the Great Smoky Mountains national park (GSMNP) and as yearlings are pushed into establishing their own territory and finding food on their own without the help of their mother, it is predicted by some that occurrences of black bear attacks within the confines of the GSM national park and neighboring areas will increase in number and ferocity as territory for each bear becomes more limited, and humans interaction increase. Just in North Carolina alone, according to the N.C. Wildlife Resources Commission, the population of black bear has grown from 4,000 in 2001 to as much as 20,000 in 2014. It is believed that approximately 7,000 of those live in the mountains of Western North Carolina in and around the Great Smoky Mountains national park. If there is any disturbance in food stock such as a light crop such as in 2009 or damage to food sources within an area, the problem with black bear attacks in and around the national park or other bear habitat be further exacerbated. There is disputed evidence that a few black bears that inhabit the GSMNP may be suffering from hearing impairment. A hearing impaired bear may not hear you coming down the trail, yelling at them or even when you are using a whistle to scare them away. 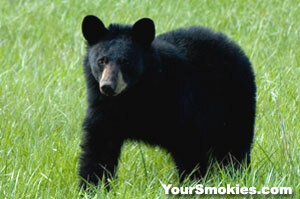 In the past 5 years we have not heard of any hearing impaired bears in the GSMNP. The bear aversive conditioning program along with public education and garbage containment had significantly reduced dangerous bears encounters in the Great Smoky Mountains over the years saving a significant number of peoples lives as well as many bears lives. With the removal of a major percentage of bear and wildlife proof garbage receptacles from the park in 2014, dangerous bear interactions should increase as the amount of unsecured trash does. Expecting that all visitors to the GSMNP will pack out there garbage is highly unrealistic. Though there is tremendous statistical proof of the overall effectiveness of this bear management program, it is believed by some that a small minority of the black bears just won't be able to programmed. It is possible that a bear who won't fear humans after programming may become more aggressive as these bears and now conditioned that encounters with human equal non lethal pain to a black bear. Bottom line, keep food and garbage contained, behave responsibly, assume any bear can attack and report any bear issues to the national park at (865)436-1230 or local wildlife officials. For humans and the bears safety it can not be stressed enough to keep food and garbage away from bears. You see a black bear in the wild? Go to a safe distance.